Color management for digitally printed textiles may be more complex than you're used to. Doing it right can also save you time and money. According to color management consultant Jim Raffel, CEO of Colormetrix Technologies, the world of digital textile printing is opening up. "There's potentially explosive growth in direct-to-fabric or -textile; it's one of the bright spots in the overall printing industry in the next five years," he predicts. "Digital textile is an area that's growing and changing very rapidly, especially dye sublimation. I suspect direct-to-textile will come on really strong in two to five years." Keypoint Intelligence DBA InfoTrends estimates the value of the worldwide digital textile printing market for garment, home décor and industrial applications at $7.5 billion, and predicts 34 percent compound annual growth rate (CAGR) to 2019. One driver of the predicted surge: The cost of technology is coming down. For example, Mutoh's new direct-to-textile printer, the ValueJet 1938TX, is priced around $40,000. Other growth factors, according to Keypoint, are the shift from mass production to more custom prints, and operational benefits such as reduced inventory, and just-in-time manufacturing. Whether you use dye sublimation or direct-to-textile technology, you'll need an advantage in this soon-to-be crowded market. Better quality prints and more efficient processes are critical - and getting color right the first time achieves both. Color management - a standard workflow to profile your printer and achieve consistent color - is the key. "Printing is printing. It's ink on substrate," says Dave Brewer, Chief Technology Officer, Image Options. "Choose the marking engine, choose the substrate, but there's a commonality." No matter the technology, the goal is to deliver the best quality product possible to your customer - whether you're working with soft signage or high-fashion fabric. And if you're working with brands, you know the importance of hitting the color spot-on. "Where I come from ... we're printing on fabric in the world of displays, stores, events. Same process, different goal. A lot of time we're matching a campaign, and we have brand colors we have to hit. We have to use some type of color-managed workflow," Brewer says. SGIA Digital Imaging Specialist Ray Weiss calls color management the most talked about - and most misunderstood - topic in the industry. "People come in for seminars, understand it, then go home and real life kicks in. They slide back into old habits," he says. "They cobble together 'Band-Aids' to get consistent, repeatable color." That includes correcting color in prepress, which Weiss, an instructor for SGIA's Color Management Boot Camp, calls a "disaster." "When you send a file back to prepress to fix it, you are now reprinting a file, and all the monies associated with creating that 'first draft' are thrown into the trash can - ink, media and the time of press operator and the prepress operator who will be doing the 'tweaking.' And it's likely that you may end up doing it again if they don't tweak it properly. A managed process would take the guess work out of this and allow you to approach it in an objective manner," he notes. "The number one reason for color management failing is it's not implemented," says Raffel. "It sounds great and it looks great; it's gotten to the point that it's relatively simple, but it's just not easy. There's a tremendous amount of documentation out there. Software is wizard-driven, but not easy. You have to read the information, bring in an expert, make a commitment of finances and time to get it in place. The simple part is taking people through the color management process. It's not easy to make the time and find the money to get it started." So what's a printer to do? Raffel's advice: "Don't get worked up. Just do it. "It's not free, but it can be very process driven," Raffel says. "When I go in, I know exactly what I'm going to do. There's a series of steps I have to follow...I don't get excited, because I know that if I follow the process, the outcome will be good. It works if you follow the process. It just works," he says. A key piece of color management is documenting the steps you take, says Weiss. "Documenting the process is even more important when you're doing textile printing. What's the temperature of the heat press? How long should you sublimate the fabric? If you don't document it, you'll be reinventing the wheel each time. That's very inefficient." 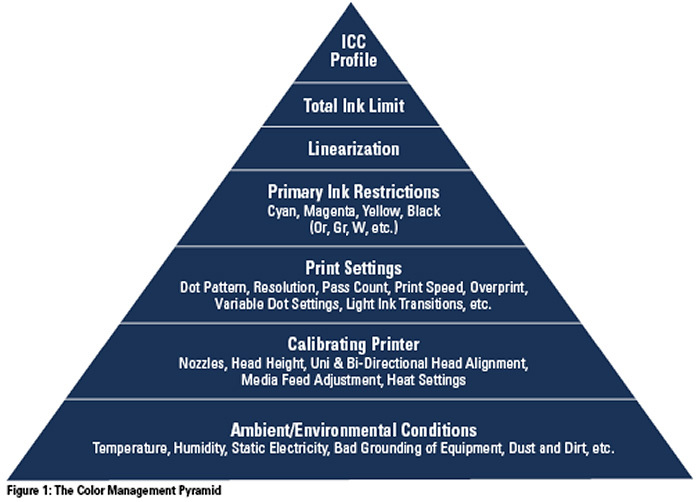 When you buy a printer, RIP, media and ink, suppliers provide an ICC profile. That canned profile does not, however, accurately represent the full capabilities of your environment, Raffel says. It's unattainable, or it's constraining your capabilities, and you may fall short. To overcome the limitations, build your own custom profiles. Mimaki USA's Tommy Martin, Product Manager for Textile and Apparel Business Development and Marketing, agrees. "Canned profiles make my life miserable. An end result needs to be achieved. Dumping ink on paper to sublimate to fabric doesn't work. Make a profile that will save you ink, time, fabric, paper and so on. If you take a canned profile and have no idea what paper or conditions it's made for, it's not useful," Martin says. If you're looking for a color management process, says Weiss, start with the SGIA color management pyramid (see Figure 1). Working from the bottom up, you'll review environmental conditions, calibrate the printer, confirm print settings, look at your primary ink restrictions, relinearize the printer. You'll also account for the total ink limit of the substrate. The data will feed into the calculations for an ICC profile. All told, the process should take between 90 minutes and 2 hours. It's a complex process, made all the more so by all the variables - everything from heat and humidity to the thickness of the dye sublimation transfer paper you use, or whether your heat press is heating evenly. Martin notes that when he starts a color management process, he first makes sure the machine is in good, working order. If printheads are missing nozzles, for example, it's going to affect output. "I look at a printer like a car. How old is it? How long has it been printing? How many hours? I ask to get some idea of how hard those printheads have been used. Printheads are like tires on a car. The more you print with them, the more they'll get worn out." Just as a car gradually gets out of alignment, colors will drift over time. The answer is to linearize the printer, which Martin likens to rotating and balancing the tires. "When you linearize a machine, you take it back to the same as the first day you had it." That's another reason to profile a machine. After relinearizing it, you'll compare the results to its first results - and to get them as close as possible. Linearization also extends the lifespan of the printheads, Martin says, leading to savings in money, defects, tech visits and ink usage. But not everyone is convinced. "I have some [customers] who relinearize their machines once a week, once a month or only under duress," he says. "I try to educate people on the front end as much as possible, wherever possible, that the extra time will help them make some sort of educated decision about the process and what they need to do." Martin stresses the importance of environmental factors in color management, too. Once, when he was conducting a color workshop for a customer in Minneapolis, Martin learned his client had the building's heat programmed to drop at night and come back up in the morning. It was November and "brutally cold" with blizzardy weather. The client didn't shut off heating or air conditioning at the end of the day, but they did turn it down, and they turned off humidifiers in the print area. Martin watched as workshop results changed during the course of the day along with increases in temperature and humidity. "I asked [the client] when they would have the highest amount of defects. It was always in the first two to three hours of the day," he said. In the end, it was a relatively easy fix: reprogramming heat and air to come on two hours earlier so the environment would be stable by the time printing began for the day. Profiling will be ground zero for your process, Martin says. If you don't start it right, everything you do will be wrong. And consistency is key -- the environment, fabric, paper and heat press all must be the same. "I have so many people that change everything, not understanding the effects down the road," he says. "You always have to ask the question, why are your results different?" For example, many larger facilities will have a sample machine in a different area of the building than their production machine. That means a different environment. Or, they may be using different transfer paper in one room than the other. That, too, can lead to inconsistent results. "When you profile for dye sub, you're profiling to the paper and the end product as well. Your fabric is the most important part of your profile. We're creating something," Martin adds. "If you're not taught the right way and the right steps, your process and end results are going to change. You're not going to be consistent with your results." Whether you're printing directly to fabric or using a transfer technology like dye sublimation, one of the primary variables is the substrate itself. "In the world of fabric, the challenge is the surface texture of the fabric. Fabric has strings coming back and forth. They're not even. Some have valleys and/or mountains. Reading a fabric is a lot harder - there's a lot more variance - when you read it with a spectrophotometer," says Brewer. "It's not complicated, it's just sometimes a matter of patience." Profiling, he notes, is taking a snapshot of a specific condition at a specific moment. If conditions change, everything that's been characterized is wrong. "That's where people make a lot of mistakes. They take things for granted," he says. The same color can appear totally different under two different light sources, he notes, or two colors can look identical under one light condition and different in another light. His point? It's important to pick a standard or to simulate viewing conditions. There are also differences that sprout from the thread, the tightness of the weave, how smooth the surface is and whether optical brighteners are used. Any of these factors can change the way colors appear. Martin sums it up: "Color management is something people really need to look at. Are you doing corporate logos that are color-specific? Are you going to do repeat assignments for clients, the exact same thing, over and over? Are you going to be doing the exact same thing on multiple machines? Do you have multiple locations, and will you be doing backup work on the same machine but in different locations?" If so, color matching needs to be part of your routine. Kate Achelpohl is a freelance writer based in Northern Virginia. You can reach her at KEAchelpohl@gmail.com. This article appeared in the SGIA Journal, January / February 2017 Issue and is reprinted with permission. Copyright 2017 Specialty Graphic Imaging Association (www.sgia.org). All Rights Reserved.